A Manitoba cancer survivor is the new face of warning labels placed on cigarette packages across the country. 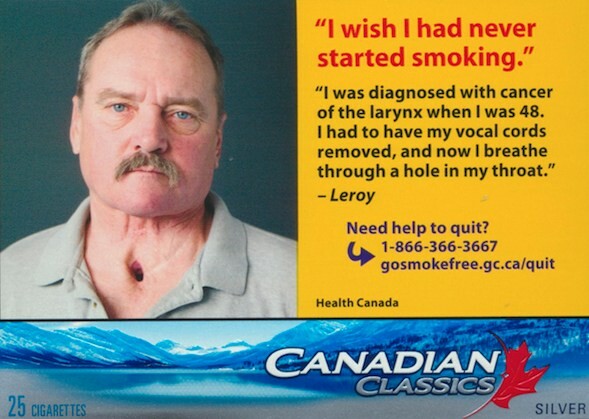 Leroy Kehler was diagnosed with cancer of the larynx at the age of 48. He now breathes through a hole in his throat and speaks through a prosthetic voice box. The lifelong smoker has spoken to thousands of school children about the health dangers of smoking, as well about the need for regulations to safeguard Manitobans from the negative health effects of smoking and second hand smoke. The new Health Canada warnings are graphic and will now cover 75 percent of the package, up from the current 50 percent, putting Canada among countries with the largest health warnings in the world. By June 19, all cigarette packages sold in retail stores must carry the new warnings.